Children nurtured in the love and grace of God learn the story of who and whose they are by watching, listening, tasting, smelling, playing, and exploring holy things in the context of a faith community. 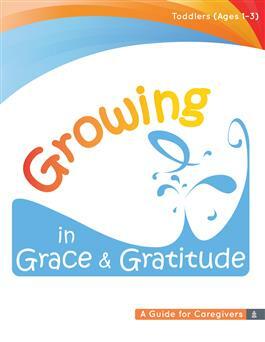 Growing in Grace & Gratitude for Toddlers (Ages 1-3) includes basic information and resources for caregivers that will help transform the lives of the youngest among us and those who love them, shaped by grace and gratitude. Growing in Grace & Gratitude for Toddlers (Ages 1-3) is non-dated, so you can purchase it once and use it year after year.